Last year, my blogging friend Krystal wrote a post about 16 Favorite Characters that she'd written. I remember thinking at the time that I wasn't sure I could name even 5 of my past and present imaginary friends because the contemporary crowd of characters sort of blends together and I didn't even finish several of my stories. But, actually, thinking about it carefully---ranging from stuff I wrote in my teens until now--I totally have my favorite characters. So here they are, with my current favorite character at #1. Lady Rossmore was a very minor character in a past draft or two of the WIP. She appeared for like three scenes, but boy, did she leave an impression. Lady Rossmore has a very snobbish, aristocratic exterior, which hides her financial desperation--Lady Rossmore is an impoverished aristocratic widow with five children, not enough cash for a countess, and very aware of her rank. Lady R had no purpose in the novel, so I cut her after draft two, but I've saved her passages because she has potential. Hikari is the little sister of Lennon McKinney of Book the First. Hikari is about twelve, much younger than Len, and while Len goes off on her journey of discovery, Hikari pops in and out of the story through her sister's anecdotes and her phone calls as a typical preteen--wondering about boys, hanging out with her friends, complaining about being bored, and watching way too much TV. Len is pretty angsty; Hikari is totally chill. Colin is the male protagonist of the NaNo 2013 project. He's serious about his work (he's a theater actor), but light-hearted; he's lonely, but personable; he sees Emma frowning in the audience of one of his shows and can't stop thinking about her. Colin is a sweetheart and is completely bowled over when he finds out that Emma wrote and had a novel published when she was 16. "You would've never even given me the time of day if we went to high school together," he tells her. Jade Preston is the on-again, off-again girlfriend of Brixton Davis in Last Request. One night, she's in a car which hits and sends Eva Fontaine into a coma--unbeknownst to Jade. Eva is Brix's best friend and the mother of his child. Jade wakes up in Eva'a comatose body while Eva wakes up in Jade's body. Unlike Eva, who is a pretty damaged character, Jade is snarky, angry, hates Eva, and heartbroken, knowing that Brix loves Eva. I didn't like Jade much at the time I was writing her and even thought of her as the antagonist. The last time I read Last Request, I found myself liking her because she's trapped in a body, unable to move, but changes by the end nonetheless. Iggy is the protagonist of the 2010 NaNo project. He's the son of a monk and a nun, raised as an orphan in an English monastery before the Reformation. I never finished his story, but I found him to be an adventurous, cheerful, if psychologically messed-up, young man who isn't sure where his religious beliefs lie as Henry VIII dismantles the Catholic Church and takes away its land. Yes, I know, he exists in real life and therefore, I cannot claim that I created him. However, I wrote so much fanfiction where he was a character in my teens that I claim my fictional "Orlando Bloom" as a character, okay? He probably didn't have much of a personality or anything beyond being the flavor of the month, but he was fun to write. So much fun that I wrote, like, 87 epilogues. Emma is the heroine of the 2013 NaNo project. Anxiety-ridden, writer's blocked, and exasperated by her political family and by people who can't turn off their damn cell phones in a Broadway theater, Emma fights her panic attacks and neuroticism at her job as a waitress at a diner and surprises herself by interacting with a minimum of social awkwardness with Colin Shelton. Emma is an autobiographical character in many ways, but we're different enough that I can say I gave birth to her. From the minute I started writing her, Alex Keegan has shown her energetic, active hoyden personality. The oldest daughter of Miles Keegan, Alex is his child by a former mistress. She likes to climb things, ride ponies, wants to be a sailor, and doesn't understand why she has to be "ladylike." She's very close to her slightly younger sister Mady and does most of the speaking for the pair. Ailey is Emma's best friend and roommate in the 2013 NaNo project. Ailey doesn't have a storyline of her own, but I know that she's a makeup artist, who also works a part time job at Sephora to pay the bills. She's intelligent, perceptive, funny, and she's a happy person who is a great listener and support to Emma. Basically the bestest friend you could ever want. Pearl appeared in draft three of The Sailor's Daughters because I decided to show the late Mrs. Keegan living before her untimely death and Mrs. Keegan needed a maid. But instead of having Pearl as a one-off character, she told me that she wanted to be the daughters' nanny. She wanted to go to England with the Keegans. Her brother was sold to a British naval officer years ago and is most likely in England--or at the very least, the best place to find his whereabouts would be in England. Pearl thinks of herself as a quiet, unassuming, timid person, but actually, her great motivation isn't freedom for herself (she's freed before asking to go to England with the family), but finding her brother. And that makes her brave--going to England, making new acquaintances, quietly breaking down barriers, and learning how to read and write along the way. PEARL! Oh my gosh, I LOVED Pearl. :D I can't believe she only appeared in the third draft; I'm so glad she did! So am I. She came in with a motivation, goals and a story when she appeared and sort of tapped me on the shoulder and said, "Um, ma'am, would you mind? I really want to find my brother." There are a few different fictional Orlandos, I think. I can't really remember. I just remember entertaining my friends with a fictional Orlando and having fun with him. Hikari is a Japanese name. It means "bright light." I love your character development elements, M--makes me want to read some of your work!! Fun idea for a blog post! I may have to try my hand at it too. 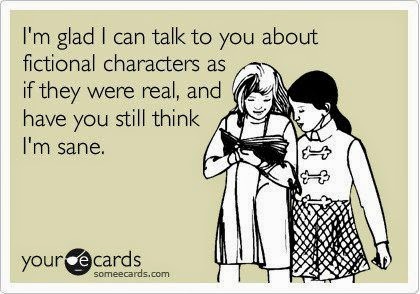 Thanks for sharing your characters. Hi Evelyn! It gives you a new perspective on your characters--made me realize that I had definitely written characters as opposed to flat people. I have tried posting a comment twice! Earlier this week and yesterday. But my darn iPhone is strange! Anywho! You know what though? I'd really like to read more about Ms. Espinosa. Like, I've always wanted to read a book about a beautiful make-up artist who is struggling with life. Is that weird? If anything, I have too many characters. They're all from different stories, though. Most of them are recent. Ailey is pretty much a composite of my friends, tbh. She helps Emma get ready to go to the Tony Awards with Colin. When my friend Jess read that story, she immediately went, "I like how Ailey is a composite of all your friends--so, obviously, she's intelligent and funny."